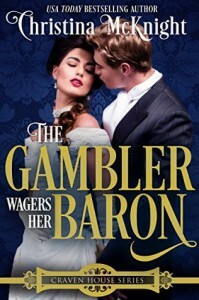 The Gambler Wagers Her Baron is another fantastic historical romance from Christina McKnight. Ms. McKnight gives us a well-written book with two flawed main characters that the reader can't help but love. Payton, with her penchant for gambling and Damon, living in misery after his wife's death, come together and bring us a story that is loaded with drama, humor, spice and a bit of suspense. The characters in this book are outstanding and my favorite part of the book. I enjoyed reading The Gambler Wagers Her Baron and look forward to my next book by Christina McKnight. The Gambler Wagers Her Baron is book 4 of the Craven House Series but can be read as a standalone.